Children commonly suffer from antibiotic-associated side effects such as diarrhea, nausea, vomiting, bloating and abdominal pain. Antibiotics disturb the balance of the microbiota causing pathogenic bacteria to become overactive while impeding the function of the beneficial microbiota. 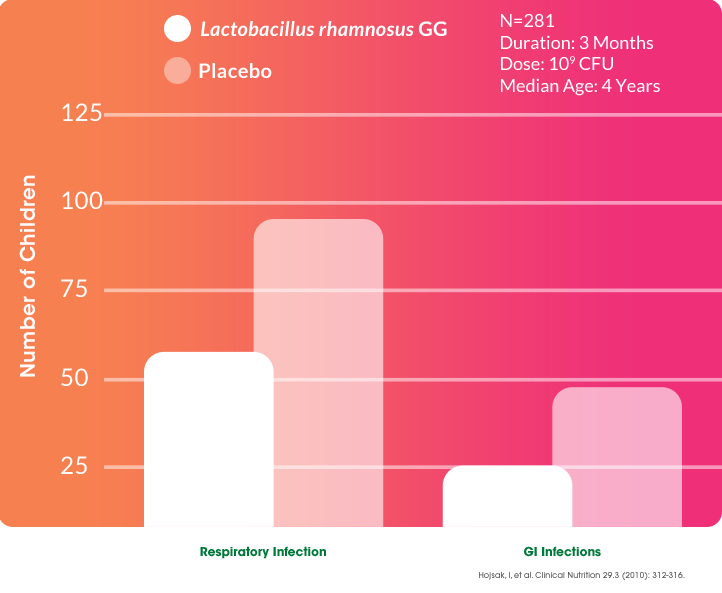 Lactobacillus GG should be recommended for children who are prescribed antibiotic therapies to help maintain the proper balance of bacterial microorganisms and avoid potential gastrointestinal distress. Many children across the world contract gastroenteritis and respiratory tract infections each year. Children’s developing immune systems are continually being exposed to new pathogens, especially in environments that encourage close social interactions—such as school and daycare—that leave children more susceptible to infection than adults. Vanderhoof JA, Whitney DB, Antonson DL, et al. Lactobacillus GG in the prevention of antibiotic-associated diarrhea in children.J Pediatr. 1999;135:564-568. 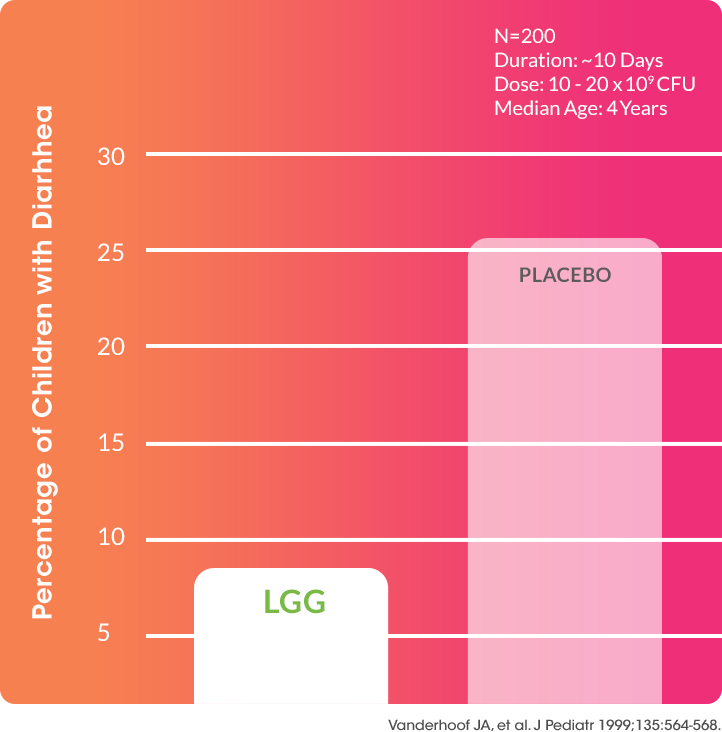 Guandalini S, Pensabene L, Zikri MA, et al: Lactobacillus GG administered in oral rehydration solution to children with acute diarrhea: a multicenter European trial. J Pediatr Gastroenterol Nutr. 2000 30(1):54–60. Hojsak, I, Snovak N, Abdović S, et al. Clinical Nutrition. 2010;29(3):312-316. Isolauri E, Arvola T, Sutas Y, Moilanen E, Salminen S. Probiotics in the management of atopic eczema. Clinical and Experimental Allergy. 2000;30(11):1604-1610. Kalliomaki M, Salminen S, Arvilommi H, Kero P, Koskinen P, Isolauri E. Probiotics in primary prevention of atopic disease: A randomised placebo-controlled trial. Lancet. 2001;357(9262):1076-1079. Kalliomaki M, Salminen S, Poussa T, Arvilommi H, Isolauri E. Probiotics and prevention of atopic disease: 4-year follow-up of a randomised placebo-controlled trial. Lancet. 2003;361(9372):1869-1871. Kalliomaki M, Salminen S, Poussa T, Isolauri E. Probiotics during the first 7 years of life: A cumulative risk reduction of eczema in a randomized, placebo-controlled trial. J Allergy Clin Immunol. 2007;119(4):1019-1021. Cosenza, L., et al. Bugs for atopy: the Lactobacillus rhamnosus GG strategy for food allergy prevention and treatment in children. Beneficial Microbes. 2015; 6(2): 225-232. Sudo N, Chida Y, Aiba Y, et al. Postnatal microbial colonization programs the hypothalamic-pituitary-adrenal system for stress response in mice. J Physiol. 2004;558(Pt 1):263-275. Partty A, Kalliomaki M, Wacklin P, Salminen S, Isolauri E. A possible link between early probiotic intervention and the risk of neuropsychiatric disorders later in childhood: A randomized trial. Pediatr Res. 2015;77(6):823-828. Nase L, Hatakka K, Savilahti E, et al. Effect of long-term consumption of a probiotic bacterium, lactobacillus rhamnosus GG, in milk on dental caries and caries risk in children. Caries Res. 2001;35(6):412-420. Glavina D, Gorseta K, Skrinjaric I, Vranic DN, Mehulic K, Kozul K. Effect of LGG yoghurt on streptococcus mutans and lactobacillus spp. salivary counts in children. Coll Antropol. 2012;36(1):129-132. Aggarwal S, Upadhyay A, Shah D, Teotia N, Agarwal A, Jaiswal V. Lactobacillus GG for treatment of acute childhood diarrhoea: An open labelled, randomized controlled trial. Indian J Med Res. 2014;139(3):379-385. 1Basu S, Paul DK, Ganguly S, Chatterjee M, Chandra PK. Efficacy of high-dose lactobacillus rhamnosus GG in controlling acute watery diarrhea in indian children: A randomized controlled trial. J Clin Gastroenterol. 2009;43(3):208-213. Guandalini S, Pensabene L, Zikri MA, et al. 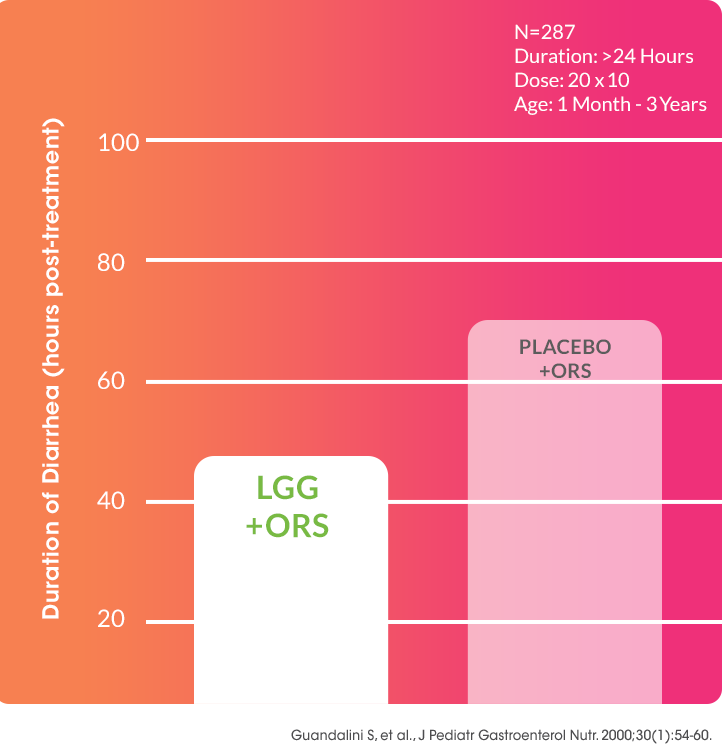 Lactobacillus GG administered in oral rehydration solution to children with acute diarrhea: A multicenter european trial. J Pediatr Gastroenterol Nutr. 2000;30(1):54-60. Kaila M, Isolauri E, Soppi E, Virtanen E, Laine S, Arvilommi H. Enhancement of the circulating antibody secreting cell response in human diarrhea by a human lactobacillus strain. Pediatr Res. 1992;32(2):141-144. Majamaa H, Isolauri E, Saxelin M, Vesikari T. Lactic acid bacteria in the treatment of acute rotavirus gastroenteritis. J Pediatr Gastroenterol Nutr. 1995;20(3):333-338. Nixon AF, Cunningham SJ, Cohen HW, Crain EF. The effect of lactobacillus GG on acute diarrheal illness in the pediatric emergency department. Pediatr Emerg Care. 2012;28(10):1048-1051. Pant AR, Graham SM, Allen SJ, et al. Lactobacillus GG and acute diarrhoea in young children in the tropics. J Trop Pediatr. 1996;42(3):162-165. Raza S, Graham SM, Allen SJ, et al. Lactobacillus GG in acute diarrhea. Indian Pediatr. 1995;32(10):1140-1142. Shornikova A-, Isolauri E, Burkanova L, Lukovnikova S, Vesikari T. A trial in the karelian republic of oral rehydration and lactobacillus GG for treatment of acute diarrhoea. Acta Paediatrica, International Journal of Paediatrics. 1997;86(5):460-465. Francavilla R, Miniello V, Magista A, De Canino A, Bucci N, Gagliardi F, Lionetti E, Castellaneta S, Polimeno L, Peccarisi L, Indrio F, Cavallo L. A randomized controlled trial of Lactobacillus GG in children with functional abdominal pain. Pediatrics. 2010;126(6):e1445-52. Saad N, Delattre C, Urdaci M, Schmitter JM, Bressollier P. An overview of the last advances in probiotic and prebiotic field. LWT - Food Science and Technology. 2013;50(1):1-16. Hojsak I, Snovak N, Abdovic S, Szajewska H, Misak Z, Kolacek S. Lactobacillus GG in the prevention of gastrointestinal and respiratory tract infections in children who attend day care centers: A randomized, double-blind, placebo-controlled trial. Clinical Nutrition. 2010;29(3):312-316. Hatakka K, Savilahti E, Ponka A, et al. Effect of long term consumption of probiotic milk on infections in children attending day care centres: Double blind, randomised trial. Br Med J. 2001;322(7298):1327-1329. Kumpu M, Kekkonen RA, Kautiainen H, et al. Milk containing probiotic lactobacillus rhamnosus GG and respiratory illness in children: A randomized, double-blind, placebo controlled trial. Eur J Clin Nutr. 2012;66(9):1020-1023. Korpela K, Salonen A, Virta LJ, Kumpu M, Kekkonen RA, de Vos WM. 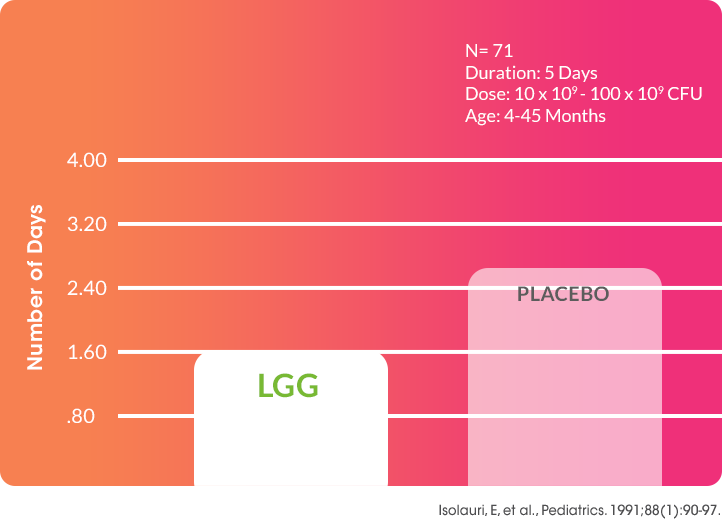 Lactobacillus rhamnosus GG intake modifies preschool children’s intestinal microbiota, alleviates penicillin-associated changes, and reduces antibiotic use. PLoS One. 2016;11(4):e0154012.